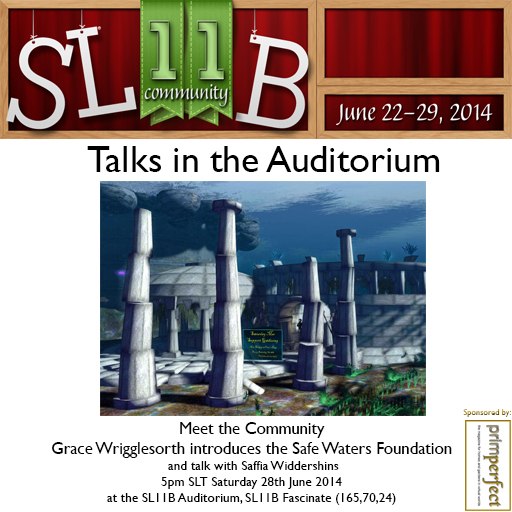 Four Prim Perfect talks today at the SL11B Community Celebrations: style, sound, art – and mer! Today, Saturday 28th January, we are delighted to have four fantastic interviews with leading Second Life residents with two sessions of Meet the Designer, then Meet the Artist and then Meet the Community Talks in the Auditorium on SL11B Fascinate (either Stage 1 or Stage 2). And another one not to be missed today is Carl Metropolitan’s talk at 3pm on Remaking the Second Life new user experience. First of all, at a special time of 9am SLT on Stage 2, Saffia will be talking to two of Second Life’s leading Home and Furniture designers – Colleen Desmoulins of The Loft, and Froukje Hoorenbeeke of Dutchie about their work, their plans and their feelings about the announcement of the planned new generation of Second Life. Next, at 2pm SLT on Stage 2, there will be a slightly different type of design to discuss. 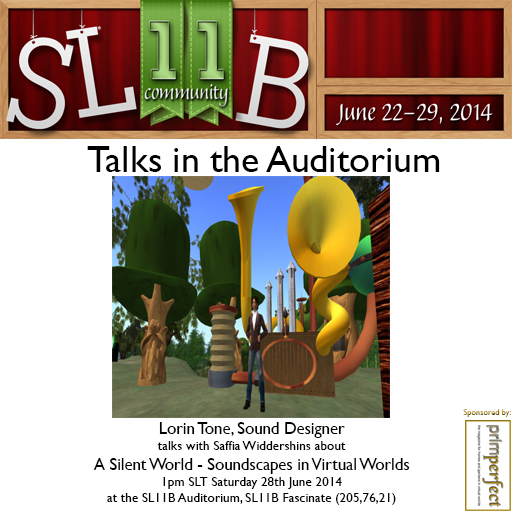 Lorin Tone, sound designer extraordinaire, will be talking to Saffia about his work and Second Life sound – and it’s entitled “A Silent World: Rant, Lecture and Discussion”. 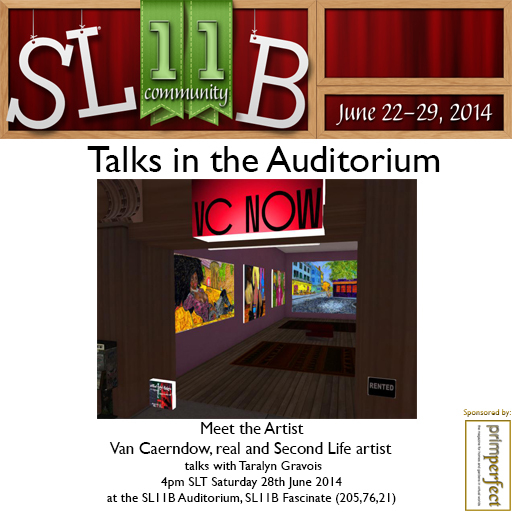 Then (after Carl Metropolitan’s talk at 3pm on Remaking the Second Life new user experience), at 4pm SLT on Stage 2, Taralyn Gravois will be talking to the artist Van Caerndow about how is real life art has carried over into sales in Second Life – and vice versa. And finally, at 5pm SLT on Stage 2, Saffia Widdershins will be talking to Grace Wrigglesworth (and possibly some pirates too!) about the Safe Waters Foundation and life the the Fanci’s Deep – as a mer or as a pirate! Previous Post: Prim Perfect talks at the Second Life Birthday today – Casa, UWA and Timelords! 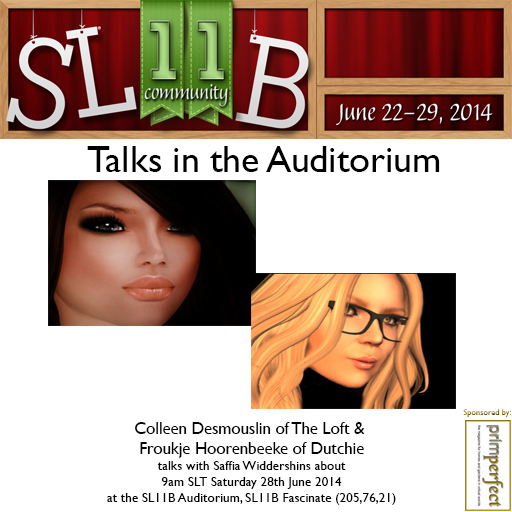 Next Post: More time to Hunt around at the SL11B Community Celebration!